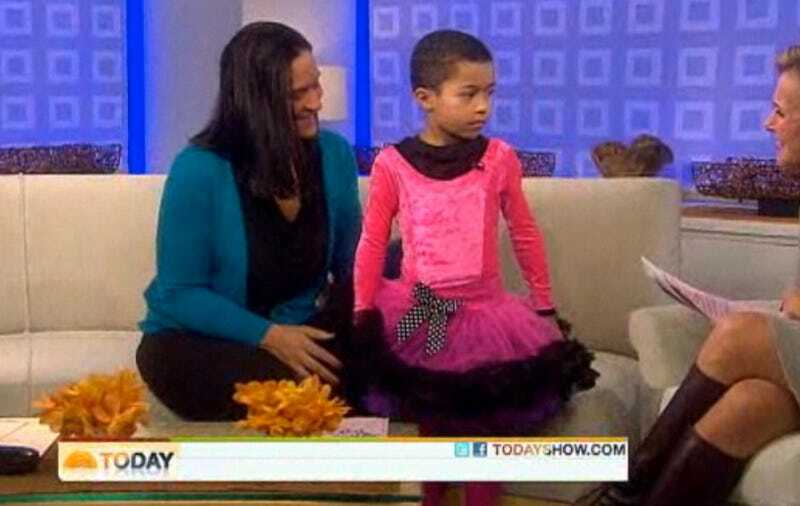 Cheryl Kilodavis and her 5-year-old son Dyson, who calls himself "Princess Boy," were on the Today show this morning, and Dyson wore his favorite color: Pink. One of the most heartwarming moments in the clip below is when Dyson's father notes, "it's not contagious." That statement really pinpoints the strange stigma surrounding kids wearing clothes that are not traditional for their gender. While some make a fuss about Shiloh Jolie-Pitt dressing "like a boy," we have a word — tomboy — that somehow says her habit is not that strange, not that unusual. But little boys wearing dresses — day in, day out, to school — is not quite as common. Still, Kilodavis and her book, My Princess Boy, are doing important work: Teaching acceptance. It was also notable that Cheryl Kilodavis said, "He knows that boys aren't dressing in dresses right now." Because most little boys used to wear dresses, and might again in the future! Who knows? As awesome as Dyson and he Kilodavis family are, it was kind of awkward when Meredith Vieira made Dyson twirl. As we could tell in a clip from October of last year, Dyson is not totally comfortable on live TV, and making him perform on command sort of turns him into a show pony. But he's adorable, and we are 100% Team Dyson.